Wet coat painting is the technical term for classic industrial painting. The wet coat process of metal finishing uses a sprayer or pump to deliver an even, attractive finish. Elite has three wet coat painting booths, allowing us to take on projects of all sizes. Our outstanding attention to detail ensures that your finished product will look better than you can imagine. Wet coat does not require an oven for finishing. It is ideal for products which cannot be heated for powder coating. Wet paint can produce a wide range of colors and textures for a more custom finish. Products that demand a thin finish can benefit greatly from wet paint. Sandblasting to bare metal is not required. Wet paint can be a highly economic finishing process. 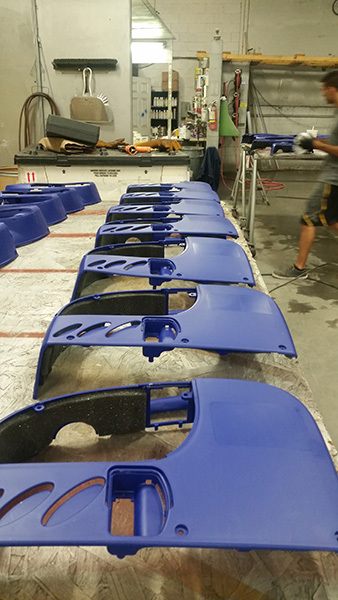 Depending on the coating selected, wet coat painting can be less durable than powder coating, so it’s important to consult an expert when considering which finishing process is best for your project. The highly knowledgeable team at Elite Custom Coatings is happy to answer your questions and give you a reliable recommendation of the right coating for your application. Call us at (919) 662-8777 today. 1,500,000 BTU Curing: incredibly durable finish.